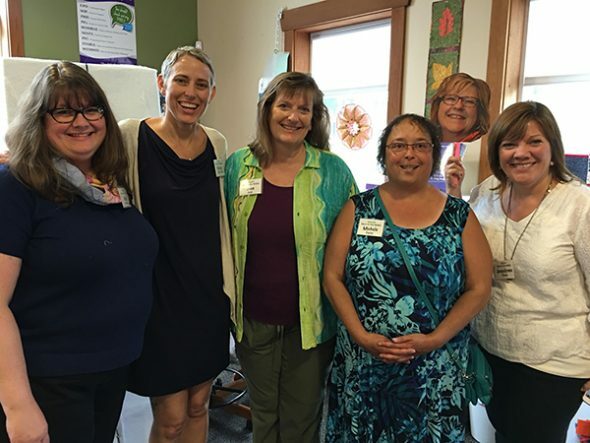 Last week, I was in Syracuse, NY to meet up with a few quilting friends, meet some wonderful Splenderettes and attend the AQS Syracuse quilt show. For The Splendid Sampler Meet Up in the Middle, we met at Calico Gals, a lovely quilt shop not too far from our hotel downtown. Pictured above, are The Splendid Sampler Designers that were in attendance, Debby Brown (Splendid Quilter), Victoria Findlay Wolfe (Block 72), Joan Ford (Block 84), Me (Block 24 Inspector Sidekick), Flat Pat and Jacquelynne Steves (Block #76). Pat had an emergency come up at the last minute, and was unable to join us in person. It was so much fun to meet everyone, and see all of their gorgeous blocks. I didn’t end up taking many photos, just too busy chatting and having fun. Below are a few that I did take. Yesterday marked the release of Block 50, Flights of Fancy, for The Splendid Sampler. This block was designed by Joanna Figueroa. Additionally, on Wednesday, Pat released a bonus block to celebrate reaching the Top of the Hill. I have two different give-aways for you all. 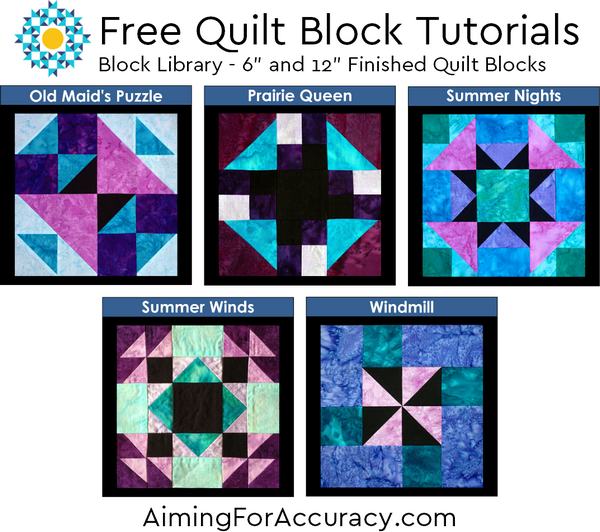 First up, five free quilt blocks for you to download. Instructions for these blocks include both 6″ and 12″ finished blocks. Download them here! 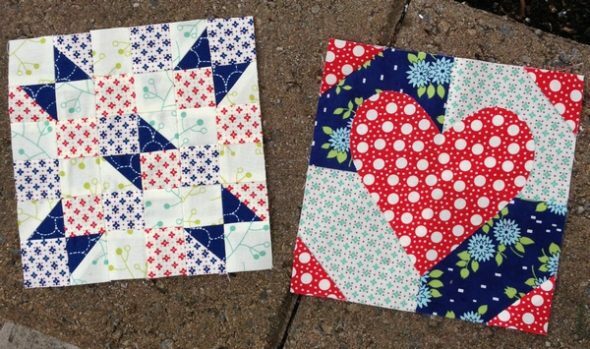 For my second give-away, two lucky winners, who leave a comment below, will win memberships to my Pieced Mini Quilt Club. To enter the give-away, leave a comment below telling me what your plans are for this weekend. Two winners will be chosen randomly to win on Monday, August 8th. I’ve been able to sneak a few blocks into my schedule this week. If you’re like me and behind, don’t worry, we’ll all be making these blocks far into the future. I have a couple of other blocks cut out and ready for stitching. I’ll be doing them as I work on other projects too. Thank you for the free block tutorials. 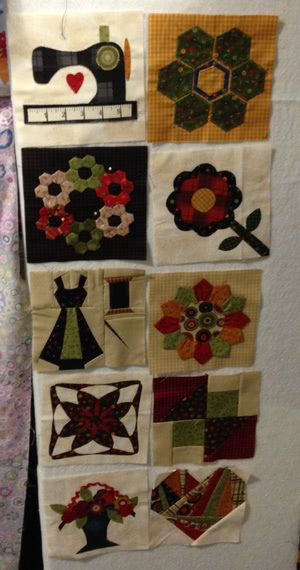 This weekend I will be working on my garden, sewing some of the Splendid Sampler blocks (I am a little behind) and taking the train into NYC to see my cousin Pete perform with his jazz orchestra at the Blue Note. 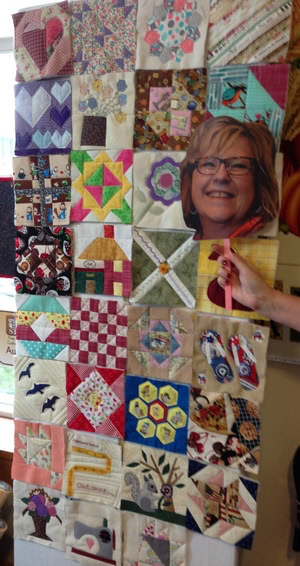 Well, that’s easy… I plan on quilting! LOL!! What else? Oh, the weekend! We are planning on cleaning out the garage this weekend since the weather is supposed to be “bearable”. Even though tomorrow is our 33rd wedding anniversary, we’ll still be together and getting something done! 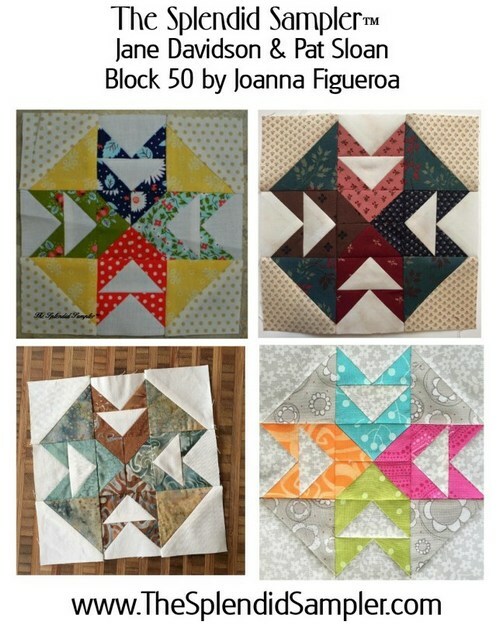 I spent today working on my blocks as I am behind on completing the 50. Tomorrow I will pack our RV and Sunday we head out to camp for a few days. We will be camping with some friends and some of us will be working on Activity mats for Alzheimer’s patients. I have made the base for 40 and they will help me finish them. It is an exciting project. This weekend we head home from a week @Hilton Head Island in South Carolina. I was able to work on all the embroidery blocks fm the splendid sampler so now I’m officially on track! Thanks for the giveaway opportunity! Thank you for the beautiful block patterns. This weekend I will be painting and shabbying some furniture for our little preloved furniture shop, as well as doing some more catchups of my Splendid Sampler blocks. I will love to win this giveaway! 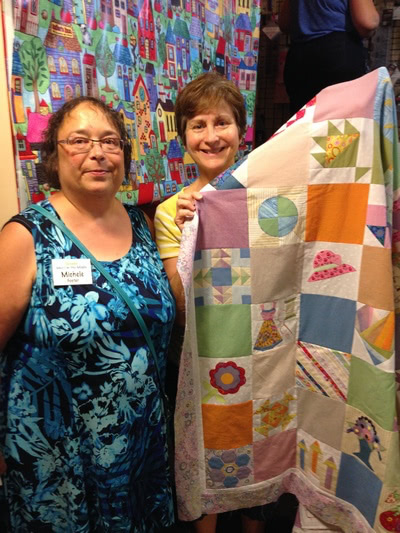 The mini quilt club is awesome! 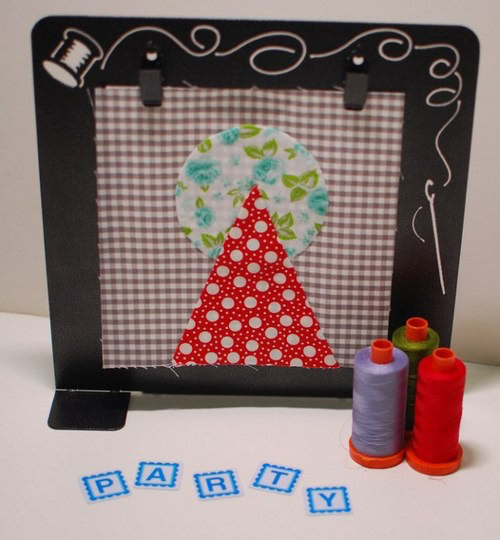 This weekend my plans are to sit down and sew my splendid sampler blocks! I’m a little far behind..specially on those applique and embroidery blocks! This weekend I’ll be watching Absolutely Fabulous at the cinema, Sweetie darling! Thanks so much for the chance to enter. We’ve had a busy (for us) week here, so I’m planning to stay at home, in my flannel pj pants, and quilt and write letters and rest up. I’m making a quick apron for a bridal shower gift, attending said shower, finishing up sewing beads on a wedding dress, making apricot jam, and if there is any day left, dealing with zucchini the size of baseball bats. Tomorrow is a day of rest, thanks heavens. hi – thanks so much for your participation in this splendid journey – this weekend I plan on helping my husband with yard work, sewing the binding on a quilt while watching tv (dvr) and cleaning – thanks for asking. We have my grandson’s 10th birthday dinner tonight – Saturday. I will be attending a ‘social’ at my LQS this morning. Doing a bit of boating tomorrow on the lake. AND, hopefully, getting some sewing done, too. My daughter is home from college (starting grad school) and we are visiting my older son in his brand new home. Grandkiddoes are having a lemonade and mini muffins stand in front of our home. We have invited/bribed our friends to come partake! Will be working on the embroidery blocks for the SS. This weekend I plan to done something fun with the hubby and work on a quilt for my MIL. I’m almost ready to start quilting it, but it looks so good I’m worried I’ll mess it up! My plans for this weekend are to finish packing for our vacation starting next week… including finishing tying and binding a quilt for my in-laws that we are delivering. Our vacation also includes ~50 of the row by row shops, so I’m pretty excited!!! Excitement for the weekend – some sewing! Also concert at Tanglewood in Lenox, MA. Planning to bring some Splendid embroidery to work on. Fulfilling a work obligation at a reggae festival with a fun co-worker. Thnx For hosting a giveaway!! So glad to know I’m not the only one behind. Thank you for the block tutorials. Now that the kids are back in school and the 3rd of 4 of the kids birthday parties will be finished this weekend, I might be able to finally start catching up a little bit. My family is traveling back home from visiting my parents. It’s always sad to leave them and head 12 hours back, but I brought unfinished SS blocks with me to work on! This weekend, I’ll be online visiting all the lovely designers on the Top of the Hill Celebrations. Probably no sewing on the SS blocks; but am looking into getting a second sewing machine. This weekend I am taking care of my 1 year old grandson while his mother visits a friend. I was at farmers’ market this morning as a vendor with fresh, home-grown produce, baked goods, and sewn items. Later today I’ll be wishing brother #4 (of 5) happy birthday. Tomorrow morning is church, then it’s relax with some sewing. This weekend I’m going to start the second notebook for my blocks. I print out all the blocks and put them in a sleeve then into a binder. Oh, relaxing in our garden!!! That’s what we will do! another weekend sitting in the ER with my husband. I spend most days at doctors visits or PT so sewing and embroidery our my stress relievers, thank goodness for small projects I can do on the go. Catching up on a couple of Splendid blocks is helping me fight a cold this weekend! Thank you for the download! This weekend I am visiting my mom and dad. We are having a very nice time. Doing a little embroidery while I’m here, but missing my stash and ready to go back home! Thank you so much for the giveaway as well as all of your work, time and talent for the splendid sampler. We really appreciate all you have done!! This weekend I am planning to put the binding on a quilt and make some dill pickles. My plan is to finish the current block for a BOM that I joined and then work on another quilt I am making for my daughter. My plans for this weekend are to spend Saturday in Rochester, MN getting a much needed haircut and shopping with my hubby. Sunday is set aside for sewing and laundry. Can’t wait to get back into my sewing room. 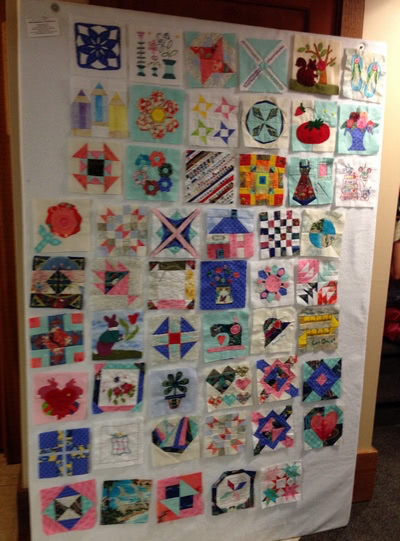 I am finishing up a quilt I started for a class that I have taught a couple of times, plus a quilt top that has been on my design wall for awhile needs some much needed attention. 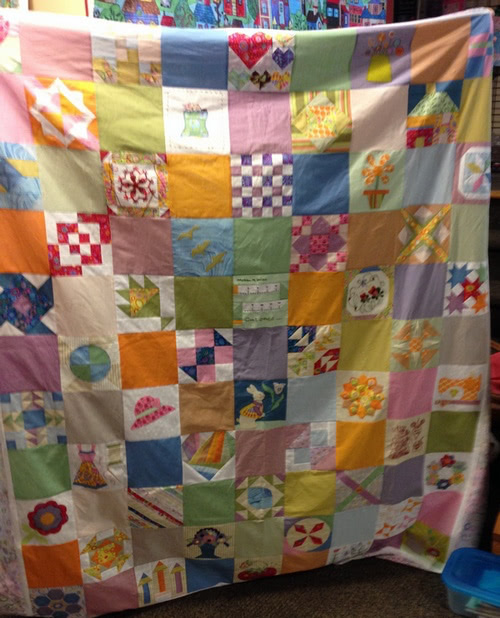 I just have to sew the blocks together and then get it quilted. my weekend plans are to watch the Olympics and do some hand stitching on my splendid blocks. Thank you for the free download. 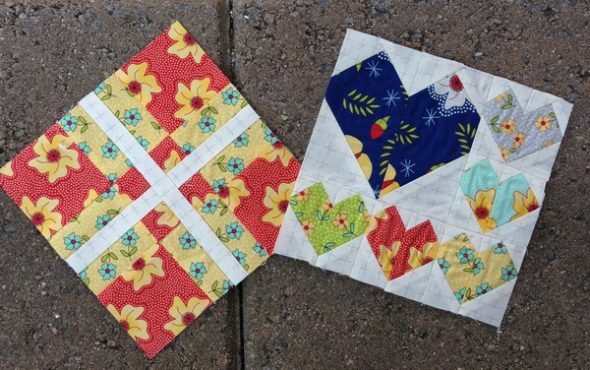 Love the pieced quilt blocks (I’m not an applique fan but I’ll jump right into these blocks!). Unfortunately, sewing is taking a backseat for the next few weeks as I am on summer holidays — first stop, Savannah, Georgia! Happy to return to our honeymoon destination this weekend for the wedding celebration of two dear friends. Not to worry…my sewing machine will still be there when I get back! A tree came down in a storm so we are working on getting the debris and tree trunk cleaned up. No damage to dwellings or people so sore muscles are our only complaint. Planning on heading to the cabin with the little ones so not much quilting going on there but will catch up on Sunday night! Thanks for all you do. Spending the weekend at lake house with family, including only grandchild. I plan to let his parents sleep in and play while I chase and hug the 18 month old. I can catch up on SS blocks later! This weekend my husband and I were traveling home from FL to NY. We were down visiting my 94 year father. Your blocks are so pretty. Thanks for a chance to win. We were having friends over for “heavy” appetizers & cocktails on our deck. Then sunday was a wonderful play in town. Thanks. On Friday afternoon, I prepared the home by cleaning it, and doing laundry, by 6 I was getting supper. Hubs home by 8:30, so we had a very late dinner… Sat. We’were supposed to go watch my least grand daughter in a fishing derby, but there was a death where my husband works, so he had to go in to work to fill in. So I stayed home and caught up on blogs, sewing and straightening my sewing room. Sunday was supposed to be church, but hubs was tired, so I got a sew date/ clean sewing room! Got several things accomplished, so I’m content!! And that ” Makes me Happy!!? It was the last weekend before I’m really back to school as a teacher. I tried to relax! Yummy!!! 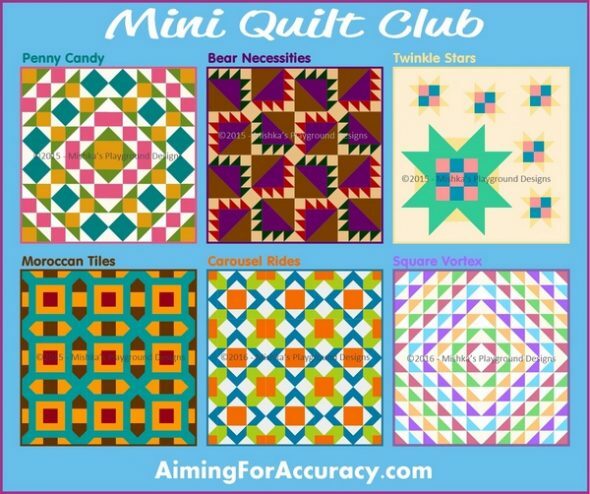 Mini quilts are my favorite as I don’t have much time for quilting. This way I can have some self gratification of getting something accomplished. Thanks for the giveaway…would love your book! I spent the weekend at the lake, picking up random wi-fi spots to stay in touch with the celebration. I’ve completed all 50 blocks so far, as well as the bonus blocks, and just love this project!